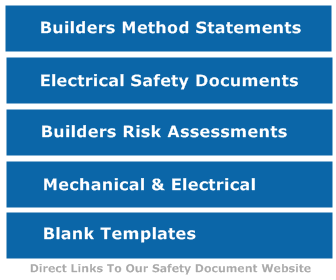 should contain any site related risks and any other specific work items not covered. the risks, an obvious first stage are the Safe Work Method Statements, these should be compiled for the project in addition to the risk assessments. Site fencing and workers access. Manual handling, Slips trips and falls, work at height etc. ( Risk Assessments, COSHH Assessments etc) RA- Slips trips and falls, Work at Height, Manual Handling, Abrasive Wheels.  Strict PPE and constant supervision.  Uses of propriety scaffolding systems and/or airbags.  Trained and experienced persons to undertake required works. COSHH completed for Products used if required. First Aid box and named first aider info within site mobile unit.  Each stage is to be planned and work carried out in a logical manner.  All existing services to be isolated and checked before works.  No un-authorized persons allowed on site during works, steps to be taken to ensure public are kept out of work areas.  Area Inspected before works commence daily, and at suitable intervals during the day.  Warning signs if required.  PPE to be worn at all times. (personal protective equipment) Gloves, face masks etc.  All areas to be kept clean and tidy at all times to reduce tripping and slipping.  All waste materials to be placed in designated skips and removed by licensed waste carriers only.